As a graduate student, I have witnessed many of my colleagues’ aspirations detour from the path of independent research because of a lack of sustainable and predictable National Institutes of Health (NIH) funding. As a consequence, these course changes in the career paths of early-career investigators will shrink our biomedical workforce and remove the opportunity for many innovative ideas and hypotheses to be explored in the laboratory. On Feb. 23-24, 2016, I was honored to be selected to participate in the first AACR Early-career Hill Day, where I was united with 14 other early-career investigators and AACR staffers on Capitol Hill to advocate on behalf of young scientists across the United States. Our message was to thank members of Congress for the bipartisan support demonstrated in 2015 that provided $2 billion for the NIH in the FY 2016 omnibus bill and to ask them to continue that momentum in providing robust, sustainable, and predictable funding increases for the NIH in FY 2017 and beyond. 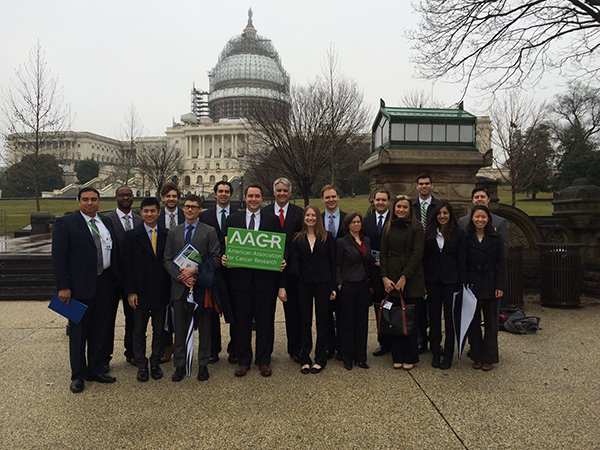 AACR held its first Early-career Hill Day on Feb. 24, 2016. My group met with offices from Texas and Louisiana, and my experience in the House and Senate buildings was incredible. The hallways of the congressional office buildings are always bustling with activity, with senators, representatives, and their assistants constantly moving from meeting to meeting. Citizens also walk the halls to attend congressional hearings, and members of various organizations meet with their congressmen to voice their concerns for their noble causes. These buildings definitely require a map for effective navigation; thankfully, the AACR partnered each group with an AACR staffer who was familiar with the Hill. I was also struck by another fact about the Hill: the long distances between meetings will definitely keep you on the move for most of the day! All told, my group held six 30-minute meetings with senior/health legislative representatives from the offices of U.S. Reps. John Fleming (LA-4), Pete Olson (TX-22), Steve Scalise (LA-1), Michael McCaul (TX-10), Joaquin Castro (TX-20), and Gene Green (TX-29). In particular, our meeting with Katie Doherty, the senior legislative assistant to Fleming, who is the representative of my hometown, Shreveport, Louisiana, was very insightful and productive. As we prepared for the meeting with Fleming’s office, we were aware that the congressman was not highly engaged on NIH issues and that our meeting with his staffers might present us with a great educational opportunity. We did not know what to expect, but we were prepared to deliver our message and to discuss his stance on supporting increased NIH funding. We discussed with Doherty the 21st Century Cures Act, its role in increasing mandatory funds for the NIH, and why supporting additional discretionary NIH funding should be a priority for Fleming’s office. Doherty asked us great questions about the effects of NIH funding on graduate students and early-career investigators. She also discussed Fleming’s office’s position on the appropriation of funds and how it would impact NIH funding. In the end, we left the meeting feeling very positive about having made an impact on the representative’s office’s support of NIH funding. 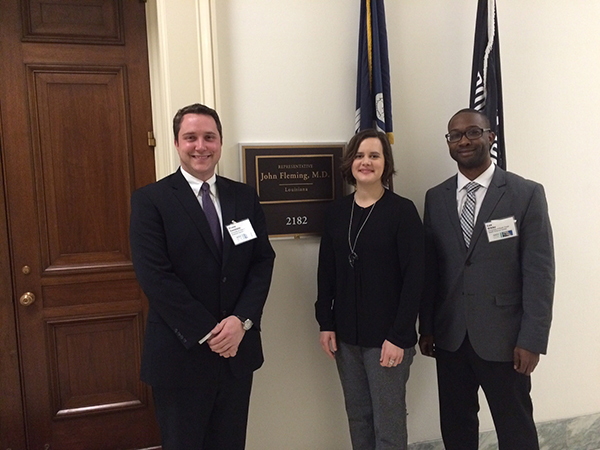 AACR Early-career Hill Day participants Shane R. Stecklein, MD, PhD (left), resident in the Department of Radiation Oncology at University of Texas MD Anderson Cancer Center, and Lee Gibbs (right), doctoral candidate at the University of North Texas Health Science Center, met with Katie Doherty (center), senior legislative assistant to Rep. John Fleming (LA-4). This event was a tremendous occasion as it trained me and my fellow early-career bench scientists in how to take our story and message to Capitol Hill. As a biomedical scientist, I have been trained in the responsibilities in the laboratory. But I also see the great value in being a “civic” scientist. Each and every one of us has a part to play in bridging the gap between science and society. I was fortunate to have the opportunity to participate in AACR Early-career Hill Day, but anyone can be a civic scientist. You can start today by writing and calling your congressman and expressing the need for making increases in NIH funding a priority for the FY 2017 and beyond. AACR has lit the flame; now, it is our turn to carry the torch from the bench to the Hill. 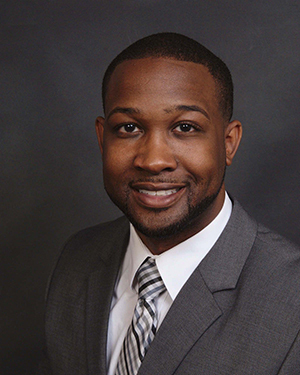 Lee D. Gibbs is an associate member of the AACR and a doctoral candidate at the University of North Texas Health Science Center in Fort Worth, Texas, in the department of molecular and medical genetics. His research investigates several genes as potential targets for diagnosis and therapy for triple-negative breast cancer. After completion of his doctorate he aspires to have a career in science policy and advocacy, developing and promoting policies and initiatives that will foster the closer integration of research and clinical practice.